Oops! It looks like I put all my eggs into one basket! When I find a deal on eggs, I make my best guess as to how many eggs our family can use before they go on sale again. This can be many dozen, as much as 20 dozen or so. I know -- that does sound like a crazy amount of eggs to buy. But there are two very compelling reasons why buying this many eggs isn't wasteful. First, did you know that the sell-by date doesn't mean the eggs will suddenly go rancid on that date? In fact, you have more than just a couple of days, unlike milk (which usually is still good for 1 week past sell-by date). And the second reason stocking up on eggs isn't wasteful is this -- eggs freeze well! About 1 to 2 weeks past the sell-by date, I freeze whatever amount I am sure we won't use within the next 2 to 3 weeks. I use frozen eggs in baking, as scrambled eggs, and for quiches and frittatas. 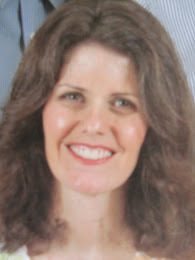 I discovered freezing eggs, many years ago, when I made a bargain-hunting blunder. At the wholesaler, they had 15-dozen cases of eggs on sale for about $4. I jumped on that one! Even if I had to throw most of them out, I would have come out ahead. My kids were all young, and not huge eaters at that point. I discovered my folly, oh, about 4 dozen eggs into the case. What to do? WHAT TO DO? That's when I got out my trusty old copy of Joy of Cooking and read up on freezing raw eggs. 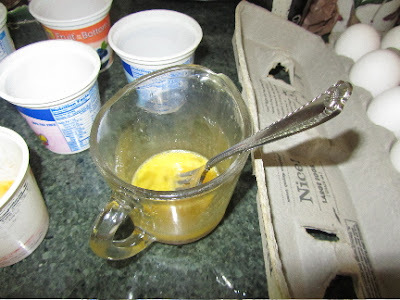 Whole eggs and egg yolks need an addition of either sugar or salt, to stabilize the texture of the yolk. Egg whites can be frozen, as is, nothing extra added. If freezing eggs for baking, where a little sweetness is fine, you can use sugar as your stabilizing agent. For most of my cooking, though, I prefer to use salt. Then I know that eggs will suit any purpose -- scrambled, quiches, or baking. Joy of Cooking gives instructions for freezing eggs measured by pints (2 tablespoons sugar per pint of beaten eggs, or 1 teaspoon of salt per pint of beaten eggs). 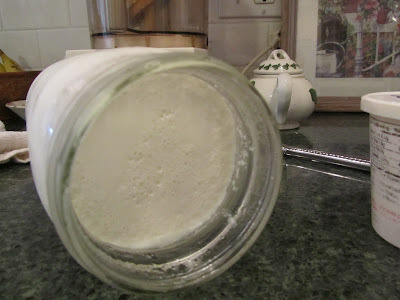 Using sugar, the ratio is just over 1/2 teaspoon (rounded 1/2 teaspoon) granulated sugar for each egg. Using salt, the ratio is just under 1/8 teaspoon (scant 1/8 teaspoon) salt per large egg. I freeze eggs in 1-egg, 3-egg, 4-egg and 6-egg portions. I freeze as individual eggs in muffin tins (then store in ziploc bags), or, as multiples of eggs in ziploc bags, or containers. I then pour the combined beaten egg and salt/sugar into a freezer container, plastic ziploc bag, or a section of a muffin tin. If freezing eggs, as 1-egg portions, I use a muffin tin. Sometimes I line the muffin cups with plastic wrap. Other times, I pour the beaten egg directly into the tin. A large egg is equal to about 3 tablespoons of beaten egg. When pouring beaten eggs into muffin tins, I measure 3 tablespoons for the first egg, then "eyeball" the remaining amounts for subsequent eggs. You can line each muffin hole with a small piece of plastic wrap, to remove eggs from tin more easily. But you can also just pour the beaten egg into bare muffin pans. 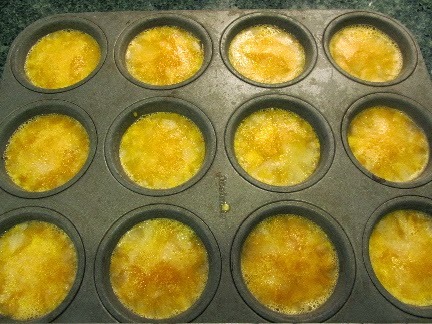 If freezing a dozen eggs in a muffin tin, I place the filled muffin tin in a flat spot in the freezer. Once frozen solid (about 3-4 hours), I set the muffin tin on the counter for about 3-5 minutes. Then I use a table knife to wedge the egg disks out of each muffin section. 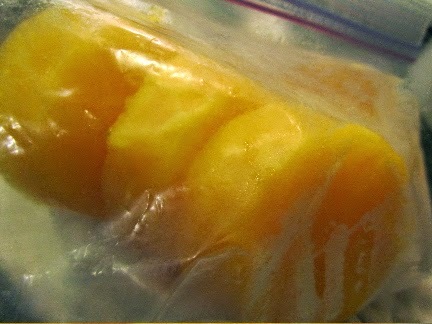 I place these in ziploc bags and keep in the freezer. To use, I thaw the number of eggs I need for a recipe, in the fridge overnight, or in a pinch, on the counter for about 30 minutes. 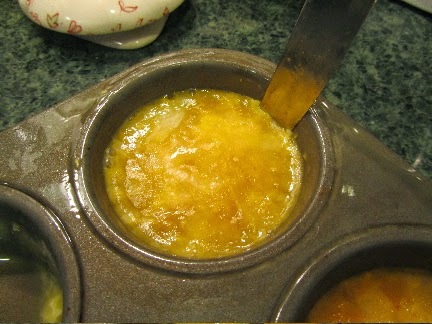 Use thawed eggs within 2 to 3 days of thawing. So, if you thaw a 6-egg ziploc portion of eggs, you can bake with an egg or two, make scrambled eggs with another egg or two, and maybe throw together a quiche with the remaining eggs, over the course of 2 or 3 days. Just remember, 1 large egg is about 3 tablespoons of beaten egg. 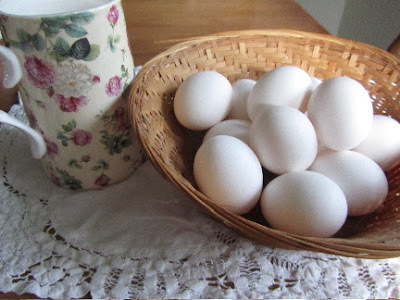 There is a "best" method for storing eggs. According to the Illinois Department of Agriculture, store your eggs at about 40 degrees, in the carton that they were originally packed. Don't store in the door of the fridge or in some pretty egg holder. Keeping them in the carton provides you with the sell-by date, handy on the carton itself. Eggs stored at this temperature, will keep for several weeks past the sell-by date. I rarely have eggs to freeze since we don't have chickens anymore. If I do have any though I'll often make quiche or egg cups and freeze for future meals. I love the idea of adding sugar for the baking eggs and salt for savory. Can the savory be frozen that way and then used to make scrambled eggs or is the texture off? Yes, you can use the frozen eggs for scrambled, omelettes, and frittatas. I use a whisk, and whisk in a tablesppon of water or milk for each thawed egg. The thawed eggs will appear slightly thicker in spots, so the whisk is handy to break that up. The only thing I've not had as much success with, with frozen eggs, is souffle. It just doesn't seem to puff up as much as with fresh eggs. You are a font of amazing information! I'll have to keep this in mind if I find a great deal on eggs! My one and only egg tip is that if you want to bring raw eggs along on a camping trip, your best bet is to crack them open and put them in a tall narrow olive jar. Apparently there's enough of a membrane or whatever that if you do this carefully, you can then pour out one raw egg at a time. The olive jar is a really good idea! Thanks for that! I haven't seen a great deal on eggs for a few years. They haven't even been that cheap at Easter. But I will keep this in mind in case I do find a good deal. The Joy of Cooking certainly has a lot of good information, doesn't it? I need to get it out more often. The Walgreen's in our area put eggs on sale about once every 2 months. I just make sure to check their digital signs, in front of their stores once a week. I remember when Easter was reliably a good time to buy eggs at a steep discount, at every supermarket. Not so much any more, unfortunately. And if the next time you have a long trip, and a few too many eggs left in the fridge, just remember you could always freeze them, to use when you return. the blender sounds like it would do a great job at combining the yolks and whites. And I like the idea of storing the eggs, frozen in flat bags. Thanks for sharing your tips! In Germany, Poland and Russia, they don't even refrigerate eggs. Every time I see it I am amazed. Even in the stores, they are stacked on a plain shelf and my son, who lives in Germany, just keeps them on top of his small refrigerator. That's fine for them. I have chickens and the eggs are washed and refrigerated asap! I am guessing that Americans and Canadians have substantially larger refrigerators, than are found in many European households. I know, in many places, eggs and produce are still stored in pantries and cellars. It may be "safe" enough, but the fridge will definitely allow foods to be kept longer. On top of the fridge, though, that's a new one to me. I'd think it would be too warm. Different strokes . . .
You know, it wasn't until this last year that I realized that eggs had to be washed. Silly me! Did I really think that they came out of the hens so pretty and clean?! do you know if you can just crack the egg, put in container with salt without whisking, and the then thaw to make a fried egg? I honestly haven't tried. But my understanding is that it's the yolks that need stabilizing to maintain their texture, and the salt has to be incorporated into the yolk. You could try just freezing one egg over night that way, and see what you think the next day. Or, if you want to get kind of creative, freeze your whites separately from your yolks, beating in salt with yolks. Then when you want fried eggs, pour your whites into the skillet, and use a spoon or spatula to break open holes in the partially-set whites, for the yolks. Pour the yolks in, and you have fried eggs. It's just the membrane to the yolk will have been broken and the fried eggs won't look so tidy.